How much can we stuff into our laneway house? Stuff is a noun. And stuff is a verb. It’s either the things you own, or it’s how you fit them into a small space. So how much do we need to make us happy? Comfortable? Content? It’s a long trail of discovery. With many things discarded along the way. Last night I watched a movie called “Happy“. It was a fascinating study of people around the world and what makes them happy. And guess what doesn’t make them happy? Stuff. Scientist types explained that wanting stuff makes us happy. And the anticipation of owning something makes us happy. We’re even happy when we’re acquiring the stuff. But owning it does not make us happy. Because once it’s ours, after a very short time it just becomes part of “the stuff we own”. And apart from it losing that new-car smell and getting a little worn, it also needs to be taken care of. Polished. Ironed. Painted. Dusted. More work for you. Oh, sure, I know you love that guitar/vintage Chanel purse/motorcycle. But how much of our stuff do we really love, and how much of our stuff is just…..stuff? We’re lucky in that our two moves this year have brought us face to face with everything we own. And we own too much. During the first move I was astonished by the stuff I found in the back of cupboards or the top of closets. Things I had not even looked at in the 13 years we had lived in that condo. I said good-bye to it quite happily. Now, as we sift through our Christmas decorations for the ones we can use, the ones that will go to family or to decorate my workplace office, and the ones that will be used to decorate our laneway home, we will be freeing ourselves a little bit more from the tyranny of owning too much stuff. 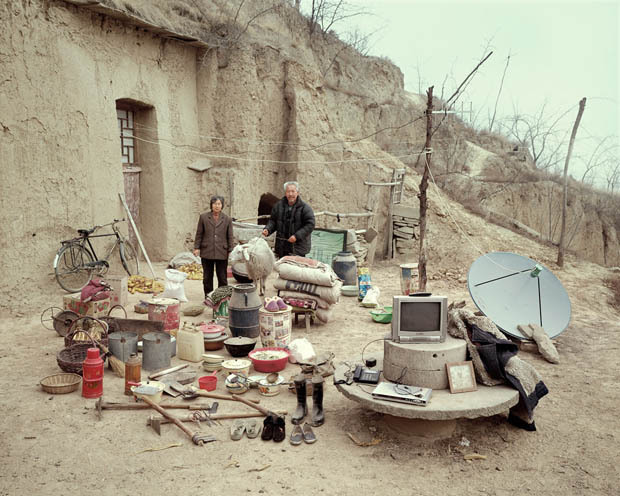 Huang Qingjun is a Chinese photographer who photographed families with all their belongings posing in front of their homes. These people own very little. What they have is precious to them. You can read more about the story here, here, and here, and read an interview with the photographer here. Even in a yurt or a mud house built into the side of the hill, these people have their TVs and their satellite dishes. 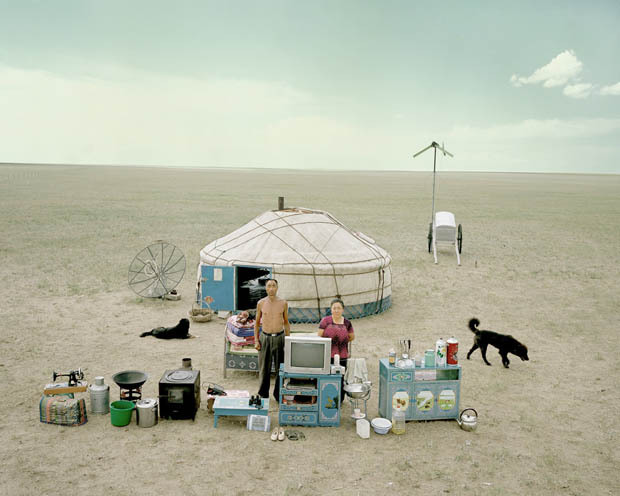 They are connected with the world outside their small homes. And I suspect they are happy. Posted in Housing, Laneway House, Minimalism, Uncategorized and tagged Lane Home, Lane house, Laneway House, Minimalism, Small Style. Bookmark the permalink. I know exactly what you are talking about! I had to downsize years again – at first It was cutting my right hand off, but as my sons sifted through my stuff, I realized these were things we had not looked at for years. like you said you found things in the cupboards you didn’t know you had. (Why hang on these these things?) I am much happier I think! Every time I move I loose another part of my lift. I think I am happier next time I move I won’t have that much stuff to move. (That’s positive!) I have really enjoyed your journey to this new venture in your life. Have fun! We just pushed more stuff onto Big Brothers. When you see those bags and boxes all piled up you realize how much extra fluff we have — and want to get rid of. It’s a continuing journey, for sure. Fascinating – thanks for introducing Huang Qingjun’s works! It’s great to get another perspective on things, isn’t it?